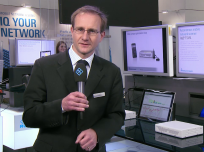 The new R&S®TSMA mobile network scanner has been showcased by Rohde & Schwarz at the GSMA Mobile World Congress 2015 in Barcelona. Capable to execute drive tests without an external PC, the R&S®TSMA provides precise, high-speed collection of RF data in all mobile networks. It either connects to a smartphone like SwissQual QualiPoc Android or runs a complete drive test software like R&S®ROMES on its built-in PC.